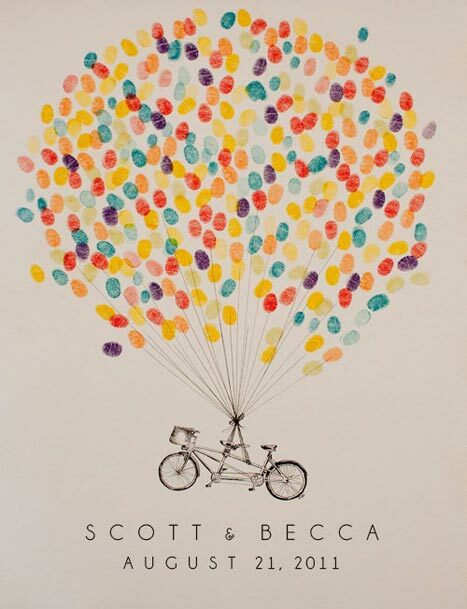 How cool is this idea for a unique wedding “guest book”, from Etsy? Though we had a traditional guest book at our wedding, I don’t think I’ve looked at it in the entire 10 years we’ve been married. (And, um, I don’t even know where it is!) I love the idea of having guests stamp their thumbprints in different colored ink on a beautiful print like this—though, I’m not sure if you’d want to keep it out after the cocktail hour, because it would look a little smudgey! But maybe that’s part of the fun? A friend of mine did something similar…thumb prints as leaves on a tree…very cute. They have it framed in their home!